Donna Karan is pushing its Donna Karan New York, Modern Icons and Casual Luxe collections via a seven-question style quiz that matches consumer shopping habits to one of the label’s lines. The United States-based label is encouraging its social media fans and blog readers to take the Seven Easy Questions Style Quiz on Facebook to find out which of three collection suits them. 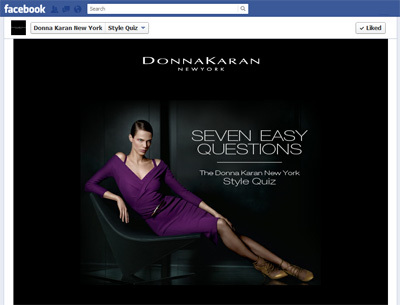 Donna Karan is offering a gift-with-purchase code to use on the Neiman Marcus ecommerce site after completing the quiz. Not only is it a quick, fun quiz, it’s also designed to make you feel confident in your dress-sense and enable you to choose which collection would suit you best with the added benefit of a discount from Neiman Marcus.Here at VIVID we enjoy luxury brands doing things a little differently. Be sure to take the quiz and let us know which collection suited you best!